As many of you know, it's been a stressful past few weeks. But what's made it easier is knowing that I have this group of people around me cheering for me, sending me notes and reassuring me that everything is going to be okay. We came out the other side of a scary situation and in large part it's because of all the thoughts and prayers that were sent out way. I truly believe that and am humbled by each and every one of you. When times are tough, all I want to eat is something comforting. Something ultra cheesy or oeey-gooey (or both really), and it has to be delicious. Cookies would be the obvious choice, to satisfy that ooey-gooey craving, but while I'd love to eat an entire batch of cookies in one sitting, that's just not something my body would respond well to. Hello, sugar crash! We need to go in a different direction with this type of craving. Something savory. Something that can be dipped in something ultra cheesy. Yes, dippable. That sounds perfect. Are you thinking what I'm thinking? Queso dip. I went the Latin American route for a few reasons. First, I'm obsessed with the flavors. Second, queso is one of my favorite cheesy dipping sauces (which we'll get to in a minute). And third? Well, third is just that you can pretty much never go wrong using quinoa in this type of cuisine. It just works. Lately you may have noticed that I'm cooking a lot more plant based. It's not for any particular reason, it's just that I've found that I don't miss meat. It's not something I crave or even look forward to in a meal. So why have it? For this recipe, I wanted to make something that was packed with protein but skipped the meat. Black beans and quinoa were my starting point, and from there my mind immediately jumped to queso. 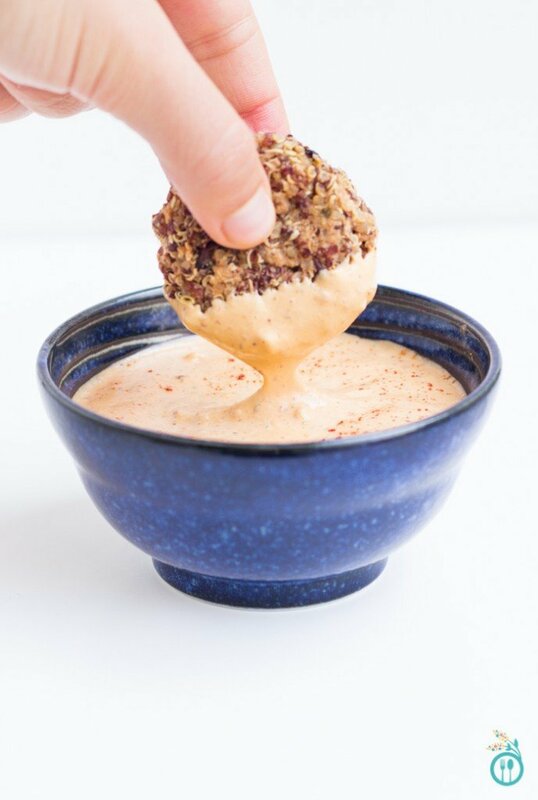 So instead of making my traditional burger-style quinoa patties, I figured what's better in queso that something you can dunk and pop into your mouth? Pretty much my new favorite dinner/lunch/snack on the planet. And while the quinoa bites are utterly delicious, it's really the queso I'm most excited to talk about. For the longest time, I felt like making vegan cheese dips was impossible. Especially cheese dips that actually taste like cheese. But as I've played around with raw cashews, I've discovered something amazing. 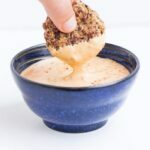 Your really can make a vegan cheese dip (or sauce, or dressing, or cream, etc.) out of nuts. And it's super easy. All you need is a high-powered blender and you're off to the races. I made this vegan queso a little on the spicy side, so you can back down on the heat if you're not a fan. The cheese flavor comes from the nutritional yeast, then there's chiles in adobo sauce for some smokiness and heat, and some garlic to round out the flavors. 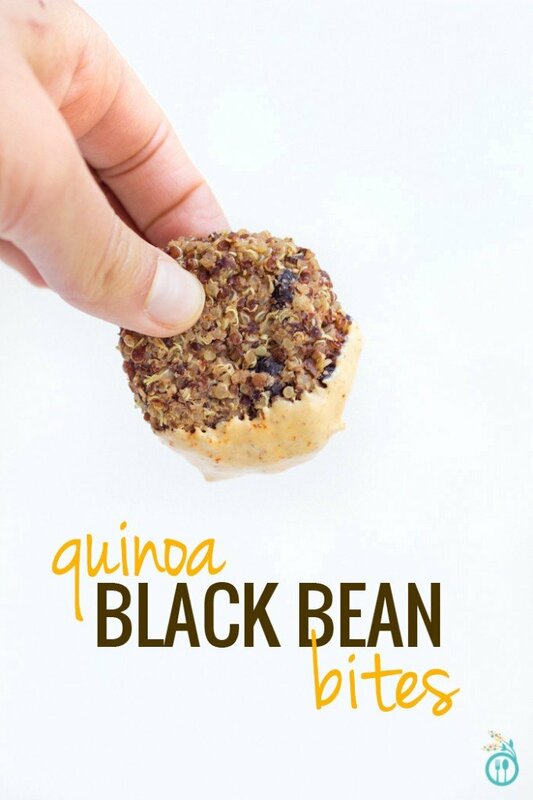 An easy vegan recipe for black bean quinoa bites that are served with an even easier vegan queso dip. 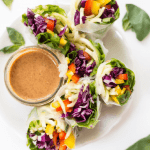 A healthy alternative to that traditional orange dip. Add garlic, shallot, jalapeno, chiles and half the black beans into a food processor and pulse until mixture is coming together, 10 - 15 pulses. Transfer to a bowl. 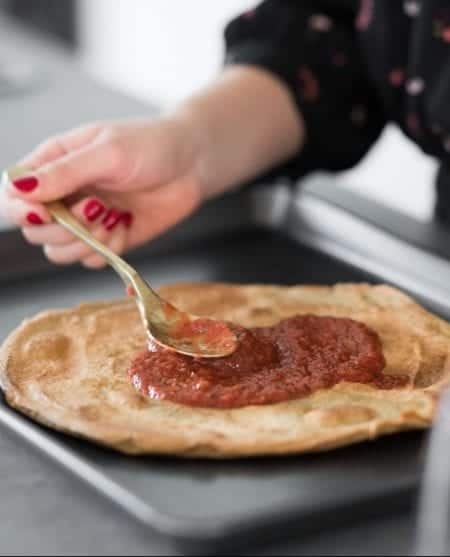 Add remaining beans, quinoa, chickpea flour and spices and stir together to form a dough. Season with additional salt and pepper to taste. Bake on center rack for 30 minutes, flipping halfway through, until bites are browned and crispy on the outside. Remove and let sit for 5 - 10 minutes. While the bites are resting, prepare the queso. Add all the ingredients to a high-powered blender and blend on high until smooth. Add blender contents to a sauce pan and heat on low until warm. Transfer to a serving bowl and dust with additional paprika. Arrange the bites around the bowl of queso on a serving plate. Serve slightly warm. If you're not using quinoa in your queso dip, you can substitute with 1 - 2 tablespoons of chia seeds. This will help the mixture stay thick. 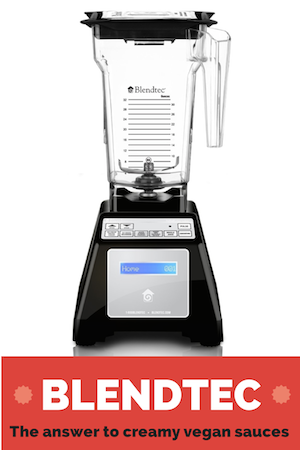 If you're looking for a new blender, then there's only one choice: a Blendtec. Blendtec's are far and above the best blender on the market and it's hands down the best kitchen investment I've ever made. I use my every single day and love it each time. It blends everything; makes perfect smoothies, soups, sauces, dressings, ice cream and I even use it to make my own flour. 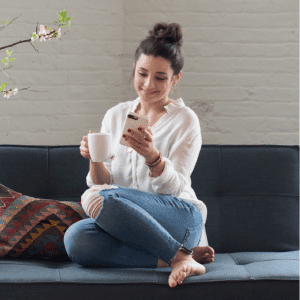 I know you'll love it just as much as me! Hi! This is a great recipe! 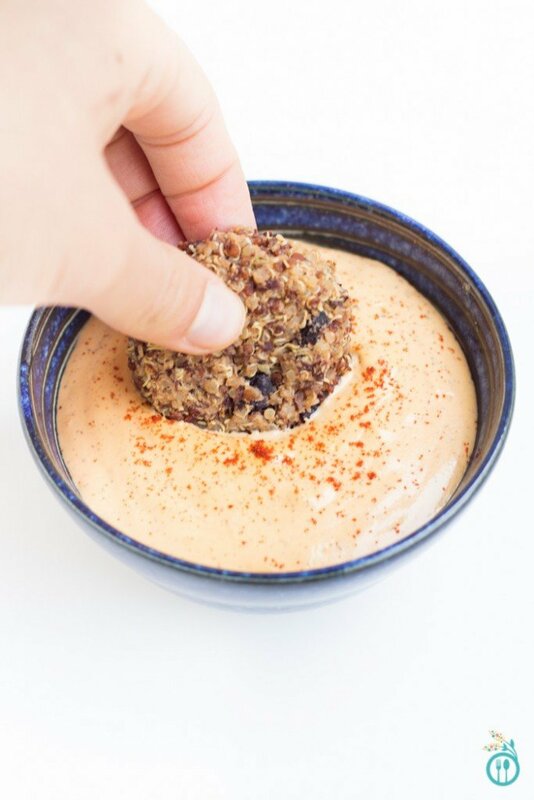 We do these bites with a greek yogurt, garlic, and dill mixture as a dip as we are not vegan. 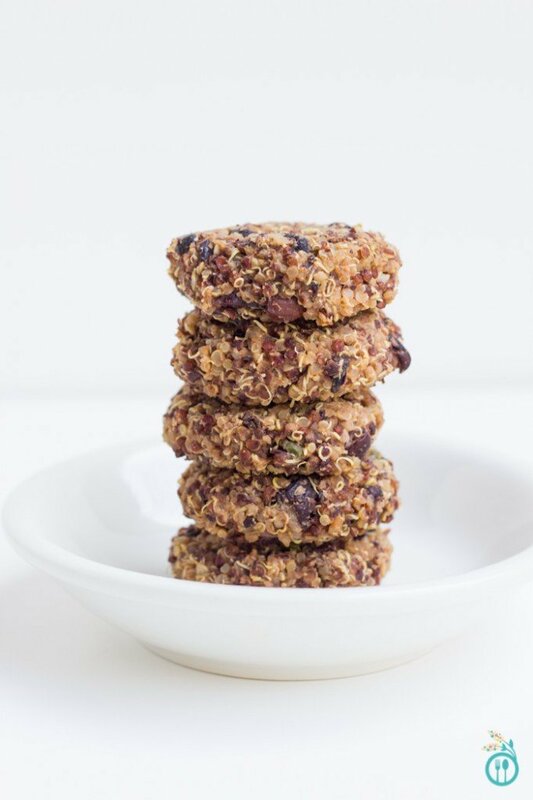 Question on the calories – I am assuming it is 38 calories per bite, and the total batch makes 24 bites? Let me know. Thanks! On my computer the list of ingredients does not show which ingredients are for the bites and which for the dip. Where does the dip-list start? Thanks!!! And wishing you a heartwarming and inspired 2018 from Amsterdam! Which ingredients belong to the queso? What brand of Chiles in Adobo do you buy? 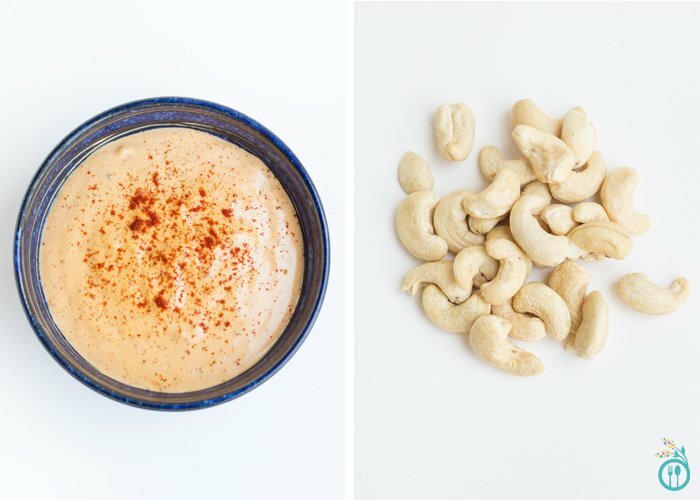 Is there a substitute for cashews for this recipe aka nut free version? I’d love to have one if there is one! Thank you for all you do. Just mad about every delicious mouthful. A good whizz of red and green cabbage, celery and carrots, a dip and some biscuit/crackers too! That is what I call a GREAT meal. These were way too hot for us. next time, I think I’d cut down on the adobo and leave out the chili powder. What can I substitute for chickpea flour? Any easy substitutes for chiles in adobo? Thanks! Eager to try this. This looks awesome! I’ve been making a lot of vegan “cheese” dips recently, and I’ve been surprised how easy and delicious they are. 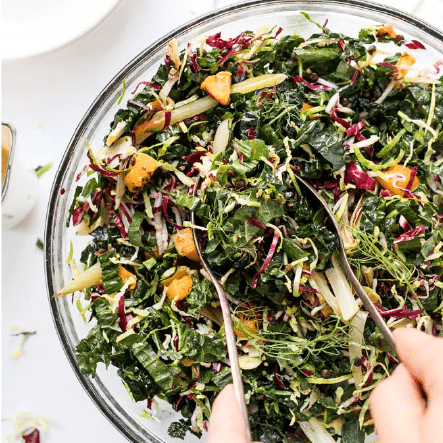 I’m adding this to my recipe queue – thanks for sharing! I love cashew/nutritional yeast mixtures. They have this great flavor combination minus the occasional tummy ache I get with dairy 🙂 Mmmm “queso” dip. I love the fact that for a bit of comfort you went with queso! I would have never guessed that it was vegan until I read through! Crazy cool Alyssa! Pinning this one for sure. They sound absolutely great. I am still only allowed juices with 1 serve of quinoa + fruit for breakfast. Hopefully soon will be able to add some more solid foods once my oesophagus has healed and I can swallow them. I shall put this one on the list, to try out, but will have to go easy on the jalapeno and chile so will try a substitute – I’ll let you know how they go. Can’t wait to try out some of your other recipes too. Oh yes, savoury and vegetarian… perfect! And perfect? Oh that lovely dog..please do send to me for I would justice that one, what a cutie! She is just on my mind and running ahead of concentration on your lovely recipes! Happy another promising veggie is coming along, no.preaching but I serve my veggie foods, the thing is those meaty people eat with gusto, no problems at all.